Product #17049 | SKU SWATEMPSW2ME4K | 0.0 (no ratings yet) Thanks for your rating! The ATEM 2 M/E Production Studio 4K from Blackmagic Design is a live event multi camera production switcher with 20 video inputs built into a 2RU chassis. Supporting NTSC/PAL/HD and Ultra HD 4K (3840x2160) video formats, the switcher connects to a wide range of cameras and sources, delivering a single programme stream in SD, HD, or Ultra HD video. All this is done live and in real time with no rendering required. The switcher features a reference video input for synchronising the switcher to other equipment using tri-level or blackburst sync. Each input also features its own frame synchroniser, which allows you to use cameras that do not feature Genlock as well as input video from computer sources. The switcher provides 20 6G-SDI video inputs and one 4K HDMI input, which shares a channel with one of the 6G-SDI inputs. Outputs include three 6G-SDI Programme outputs, one HDMI Programme output, six 6G-SDI auxiliary outputs. All inputs and outputs are SD/HD/UHD switchable, with the exception of dedicated down-converted HD Programme output for monitoring UHD footage on an SDI-equipped HD monitor. Two independent multi-view outputs are available, in both SDI and HDMI, so you can monitor up to 16 cameras across two screens. The switcher features luma and chroma keyers for real time effects and composites in Ultra HD, with 10-bit processing. Two downstream keyers allow you to use two graphics/logos/titles/lower thirds from up to twenty stored graphics in a wide variety of formats. Additionally, the switcher features a built-in SuperSource layer switcher which, in addition to the two full M/E's, keyers and DVE, provides an additional four independent DVE channels letting you re-size and position live cameras, video replays, broadcast graphics, and more. A built-in 22-input audio mixer handles the embedded HDMI and SDI audio from the 20 active video inputs as well as audio from the balanced or unbalanced analogue audio inputs to provide you flexibility and creative audio options. Audio output is embedded in the SDI and HDMI stream, as well as available via balanced audio outputs. The control panels connect via the Ethernet port and provide control all the features of the switcher. Illuminated front panel buttons on the switcher allow you to locally select the aux output, while a 2-inch LCD screen built into the front of the unit allows you to see the aux output for instant confirmation of the correct output. Each input incorporates its own frame synchroniser, which enables you to use cameras that do not have genlock capability or to input computer sources such as Keynote or PowerPoint Presentations. The switcher features two programme outputs for the final video, delivering SD/HD/Ultra HD via three 6G-SDI port and one HDMI 4K connector. The switcher features six SDI auxiliary outputs capable of delivering the programme out feed with or without the downstream keyer effects in SD, HD and Ultra HD. Control of the Aux output is by front mounted panel buttons, and built-in LCD screen for immediate confirmation of the Aux output. 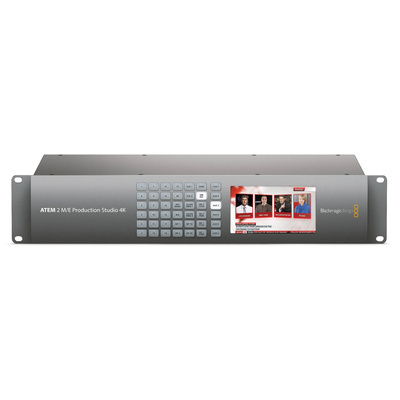 The ATEM 2 M/E Production Studio 4K switcher features four built-in transitions. Cut: ATEM instantly changes from current programme source to the preview source precisely at the moment you hit the button. Cuts can be performed by directly selecting sources on the programme bus or more commonly by pressing the cut button to transition to the next source lined up on the preview bus. Mix: Dissolves from one image to another. You can programme a pre-set transition rate, or use the included software control panel or available hardware panels to manually transition from one shot to another. Dip: Is similar to the mix/dissolve, except it first it transitions to a colour/graphic or video source and then to the next shot. Wipe patterns: With 18 built-in wipe patterns, you can create over 100 different transitions, and the patterns can be inverted or softened and you can customise the colour of the border. You can also insert up to three live video streams into the borders. The switcher features four upstream keyers and a DVE, allowing you to layer live video, title, graphics and animation over live video. You can choose from chroma, luma, linear, and pattern keys at Ultra HD resolution with 10-bit processing. The switcher uses an Ethernet connection to interface with control surfaces such as the optional ATEM 1 M/E and 2 M/E Broadcast Panels. You set the format for each project you are working on, from SD to HD to Ultra HD, selecting resolution and frame rate. This is accomplished by using either the included software for Mac/PC or via the ATEM 1 M/E or ATEM 2 M/E Broadcast Panel. The switcher is 2RU in height and has built-in rack mount ears for mounting in a production road case or in a post production facility. Note: Also supported are: 24, 30, and 60 Hz inputs when switcher is in 23.98, 29.97, and 59.94 Hz formats respectively.